For K-12 Educational Facilities Professionals, WAXIE understands that you need to provide a clean and safe learning environment for your students and staff at the total lowest cost – and WAXIE delivers innovative educational facility maintenance supply and hand hygiene solutions, along with K-12 educational facilities-specific cleaning expertise, consultation and training that contribute to lower operating costs, enhanced public image and increased attendance and student performance. WAXIE has Inventory Centers strategically located throughout the Western United States to serve you. WAXIE is also an engaged and caring member of each of the local communities we serve, and we are committed to doing our part to contribute to clean, safe and healthy educational facilities. WAXIE works with you to deliver a fresh, healthy and clean learning environment. We have been working with college and university campuses like yours since 1945, and our experienced and knowledgeable consultants and specialists have been trained to solve your most challenging educational facility maintenance needs. And our market-specific but broad product solution offering and extensive customized training support for educational facilities illustrate how WAXIE is a company which has been purpose-built to serve those who are responsible for keeping our college campuses clean and healthy. WAXIE works with you to deliver a custom-fit cleaning solution. 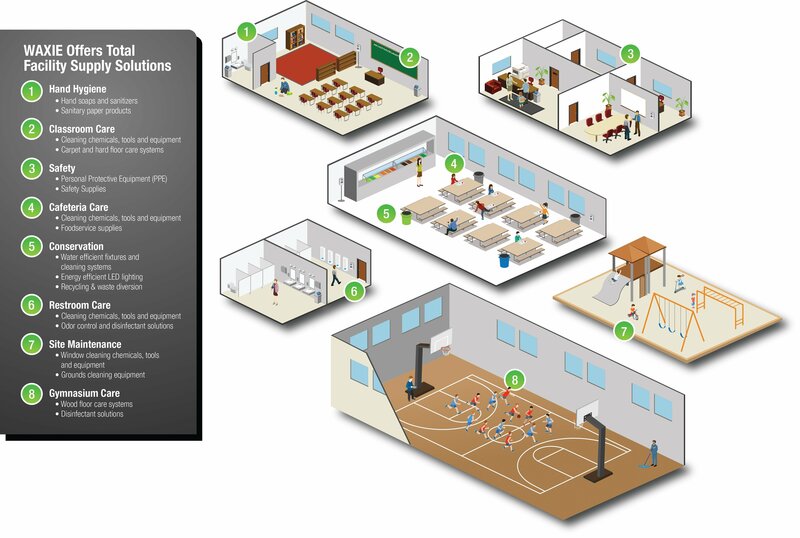 Our consultative approach benchmarks current maintenance practices and then designs a custom-fit total campus facility maintenance solution which delivers you the results you need. Specialized focus on Higher Education solutions means that you can rely on WAXIE’s expertise to help you create a cleaner, healthier and safer learning environment – one which will contribute to increased student attendance and productivity. WAXIE works with you to deliver the best value and overall cost savings. Our consultative approach identifies laborsaving recommendations which help to mechanize the cleaning process and increase efficiencies. With Negotiated Price Lists (NPL’s) on both local and national contracts, you can count on consistent pricing and product deliveries. And our WAXIE web@work e-commerce platform with incorporated budget management tools gives you control of, and visibility to, you overall facility supply spend, making it easier for you to manage. WAXIE works with you to help you reach your sustainability goals. WAXIE GPS® Green Partner Support™ is a collaboration and partnership between WAXIE and your college campus – and it is a comprehensive approach which addresses everything you will need to implement an effective green cleaning program which reduces impacts on both human health and the environment. WAXIE has the experience and expertise to help guide you to campus facility maintenance solutions which will help you reach your overall sustainability goals. 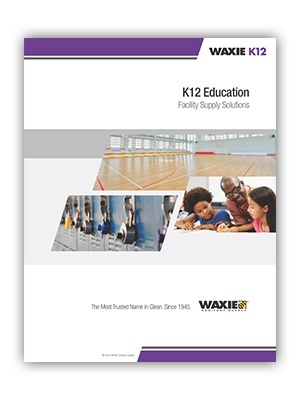 Fill out this form to Download the WAXIE K12 Brochure. You will then be provided a link.